Your brain is the most valuable asset when it comes to learning and absorbing information. Who would’ve thought, right? 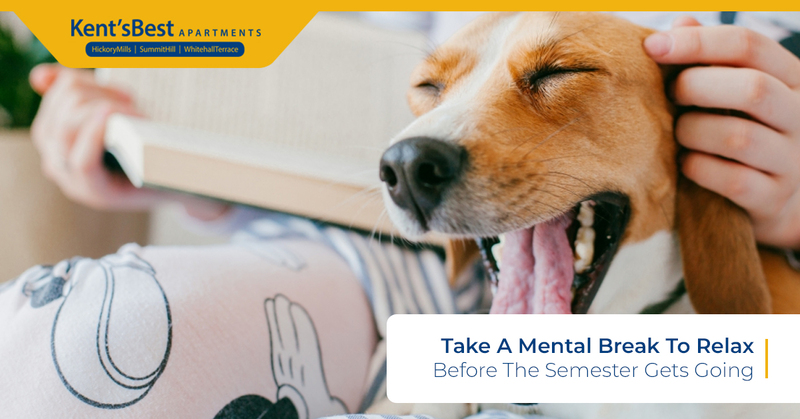 In the same way that a bodybuilder treats their muscles with the utmost care and attention, you’ll want to maintain your brain in order to really excel this coming semester. You certainly don’t want to begin the new semester on a stressed-out note, and you also don’t want to start out syllabus week scatterbrained. It’s with this in mind that Kent’s Best Apartments, your source for convenient and amenity-packed student apartments near Kent State University, encourages you to do whatever it takes to calm your mind and start out the new academic year on a zen-like note. Here are some easy but effective ways to do just that. Music is a powerful and versatile force that can invoke a broad range of emotions. Choose something that calms you, something that you’re comfortable with and don’t mind hearing for a couple of hours. Though many people around the world meditate as an act to still their mind and fulfill their quest for spiritual enlightenment, meditation offers a lot of value beyond that of spiritualism. Simply taking the time to close your eyes, focus on your breathing, and become aware of the present moment is more than enough to relax you. Meditation is doesn’t cost you anything except for a little time out of your day, it’s highly accessible, and incredibly beneficial — especially for stressed-out college students. Regardless of what your views are on the effectiveness of essential oils “curing” various ailments, the skeptics can’t deny that certain oils just smell great. There are stimulating oils like peppermint, calming oils like lavender, and even blends designed to make you feel a certain way. Diffusing essential oils in your apartment space is a great way to not only make things smell wonderful, but also help calm your mind and relax before the semester fires up. All too often, reading (in an academic context) is associated with cramming boring information into your brain. Fortunately, you don’t have to confine reading to your textbooks. Visit the library, grab a book or two from your parent’s house before you head back to our Kent apartments, or even hit up a used book store to find a novel (or six) that’s up your alley. Whether you’re interested in romance, sci-fi, true crime, western literature, vampire, medieval lore, or twisted dystopian cyborg story, you’re sure to find something that really draws on your interest and captivates you. Truly, a good story can help you escape reality for a little while. Our job is to provide Kent State University students with a safe, comfortable, and convenient apartment near KSU. Your job is to learn, develop connections, and further your career here in Kent. Let us know how else we can help! Feel free to contact us at any time.